Steel Beasts expert and blog reader Koen has kindly offered his help to deploy the red troops and to create an OPORD for them (i.e. input/plot the orders for the Soviet units in this scenario). This entry is explain the grand-tactical situation of the North German Plain scenario and to delineate the scope of what will be an Steel Beasts ProPE scenario. Keep in mind that this is a work in progress and that nothing is set on stone yet. Your feedback is always appreciated. 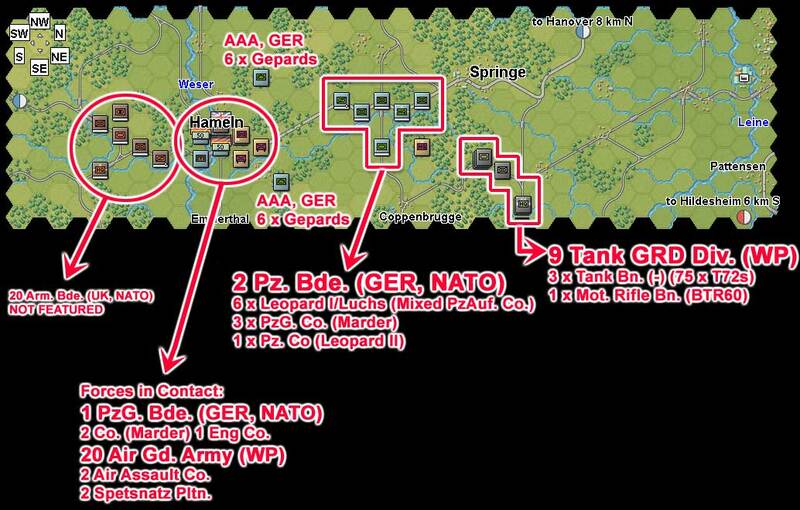 The North German Plain scenario. The North German Plain scenario starts with a Soviet air assault on Hameln which is defended by two mechanized companies of the 1 PzG. Bde. NATO attempts to relief the troops in Hameln. So do the Soviets. I want to focus the Steel Beasts scenario in the fight between two companies of the 2 Pz. Bde. and the massive Soviet forces attempting to linkup with the airborne troops in Hameln. The 9 Tank Guards Division will be deployed by Koen. That's 75 T-72 tanks and BTR60s in battalion strength. The Steel Beasts ProPE scenario map. The city in the west is Hameln. Two PzG. companies from the 2 Pz. Brigade are approaching Hameln from theeast. The irregularly shaped black polygon in the north is the blue deployment area. The area where Koen will be positioning the Red troops is shown on the west. The objective of the Soviets will be to linkup with the airborne troops in Hameln at a final strength no less than 40 tanks. The objective for NATO will be to avoid such a thing from happening. I will be sending Koen the scenario draft shown above and he will work on it. He is on vacation now and there will be a short delay. Sounds like a great idea! Looking forward to see how it develops. Thanks for your comment. As soon as my contact comes back from vacation (around the first week of August), we will have news about this one. I'm still, to this day even, torn between picking up SBProPE or saving my money. JC, what program have you been using to create the overlay graphics?